This is the first post in my warm salad series! The inspiration for this set of posts came when I was getting all excited about heart and belly warming recipes that would get me through the autumn and winter months. Nonetheless, the more recipes I came up with the more worried I got about my waist size – winter weight may be one way of keeping the frost from biting, but I’d rather just put another jumper on this year. And so the warm salad series was born! It’s no surprise that these salads will involve some method of cooking so expect some grilling, griddling and baking. 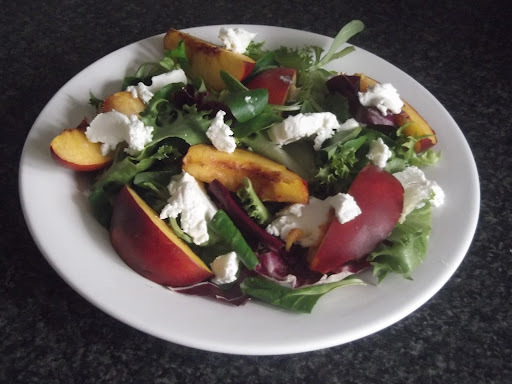 Grilled Nectarine and Goats Cheese Salad. Cut into the nectarine until the knife hits the stone in middle. Work the knife around the stone, then twist the two halves so that one comes away from the stone. Take the stone out of the other half and then cut the nectarine flesh into segment. Place the nectarine under a hot grill for 2-3mins until the flesh begins to caramelise. In the meantime, assemble the salad leaves, cherry tomatoes (halved) and spring onions (finely chopped) onto a plate. 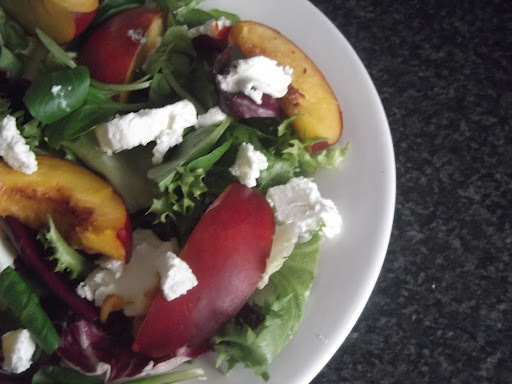 Add the nectarine segments then crumble over the goats cheese before serving! I must confess, I’m not really a big fruit eater – although I love sweet things fresh fruits just never really been my thing. When I do eat a piece or two, it’s normally dipped in chocolate so I never thought I’d be putting fruit with something savoury like a salad! However the sweetness of the nectarine, caramelised by the grill works really well with mellow and creamy goats cheese. Do you like fruit in salads? What’s your favourite combination? Let me know in the comments below.